Detoxification is incredibly important, but it just doesn't feel good. You could feel better drinking coffee every few hours to keep the level of caffeine in your blood constant, or you could take drugs like Excedrin, Cafergot, or Migrainal, which have narcotics, barbiturates and caffeine as their ingredients. It it's all too much for you, you could simply stroll down to the liquor store or go pick up some crack. The varying effects are just a matter of degree. At the end of the day, either you or your addictions will be in control of your life. It's your choice. For some, the most convincing evidence will be the documented studies showing the harmful effects of coffee. In terms of disease, hundreds of studies have shown a slight negative impact from coffee across dozens of areas while some have shown some positive sides. At the end of the day, one cup of coffee will probably not kill you or save you. There are numerous effects of coffee that are still worth considering, however. The end result is that drinking coffee increases the reaction of the body to the stresses of everyday life (3), revving you up to unnecessarily highs at the slightest provocation. It also interferes with your body's ability to calm you down. Gamma-aminobutyric acid is a neurotransmitter naturally produced in the brain and nervous system as well as the heart that plays an important role in mood and stress management and influencing a person's sense of well-being. Caffeine has been shown to prevent Gamma-Aminobutyric acid from binding to its reception points in the body, preventing it from performing its calming function (4). Why do most people drink coffee? They want to have more energy. How do you get energy? You sleep. Stimulants don't give you energy, they stimulate the you by making your body use its vital reserves to clear them from your system. When stimulants are taken in, blood pressure, temperature, and respiration rise. Adrenaline is pumped out of the adrenal glands and our senses prepare for flight or fight. In short, we are suddenly awake, but we have not suddenly become well rested and energetic. The opposite has occurred, because the body has been forced to sacrifice its vital reserves to prevent damage to itself. At the price of this vitality we have temporarily bought off the need for sleep, but there's no less need for it. The physiological functions and rejuvenation that should be occurring is not, we we pay the price by aging. 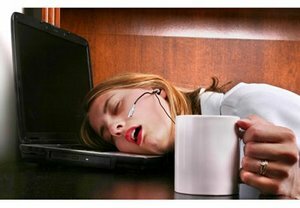 Lack of sleep has been shown again and again to promote disease and premature aging (5). Even among moderate coffee drinkers (2 or more cups a day), consumption considerably increases the risk of miscarriage and decreases birth weight (7,8). Coffee Damages The Heart and Arteries. In one study, about half of the moderate coffee drinkers in a 4,000 person study averaged an increased heart attack risk by an average of 36 percent compared to those who drank none or little. The study proposed the other half o the group may metabolize caffeine more efficiently due to a genetic grait and so receive less stress from the coffee (9). Another showed that coffee drinkers showed a greater hardening of the arteries compared to non coffee drinkers (10). At the end of the day, the the effects of coffee are ambiguous enough that you could easily convince yourself that it's not going to seriously harm you. I think the the greater impetus for giving it up is freedom. Do you want to be a slave to a substance? Do you want your energy to be controlled by its comings and goings? Why not embrance a low fat raw vegan diet and the accompanying lifestyle of health and see your energy levels skyrocket naturally? Learn how the effects of coffee play into concerns about other harmful foods. Embrace a holistic, healthy lifestyle. Eat a healthy raw food diet that will allow you to thrive. 2) Kerr, D., Sherwin, R.S., Pavalkis, F., Fayad, P.B., Sikorski, L., Rife, F., Tamborlane, W.V. and During, M.J. 1993. Effect of caffeine on the recognition of and responses to hypoglycemia in humans. Annals of Internal Medicine. 119(8):799-804. 3) Lane, J.D., Pieper, C.F., Phillips-Bute, B.G., Bryant, J.E. and Kuhn, C.M. 2002. Caffeine affects cardiovascular and neuroendocrine activation at work and home. Psychosomatic Medicine. 64(4):595-603. 4) Roca, D.J., Schiller, G.D. and Farb, D.H. 1988. Chronic Caffeine or Theophylline Exposure Reduces Gamma-aminobutyric Acid/Benzodiazepine Receptor Site Interactions. Molecular Pharmacology, May;33(5):481-85. 5) Spiegel K, Leproult R, Van Cauter EV. Impact of sleep debt on metabolic and endocrine function. Lancet 1999;354(9188);1435-1439. 6) Bracken MB, Triche EW, Belanger K, et. Al. Association of maternal caffeine consumption with decrements in fetal growth. Am J Epidemiol 2003; 157(5): 456-466. 7) Vik T, Bakketeig LS, Trygg KU, et al. High caffeine consumption in the third trimester of pregnancy: gender-specific effects on fetal growth. Paediatr Perinat Epidemiol 2003; 17(4):324-331. Rasch V. Cigarette, alcohol, and caffeine consumption: risk factors for spontaneous abortion. Acta Obstet Gynecol Scand 2003;82(2): 182-188. 8) Weng X, Odouli R, and Li D-K. Maternal caffeine consumption during pregnancy and the risk of miscarriage: a prospective cohort study. Am J Obstet Gynecol 2008;198:279.e1-279.e8. 9) Campos, H, Cornelis M, El-Sohemy A, Kabagambe, E. Coffee, CYP1A2 Genotype, and Risk of Myocardial Infarction. JAMA. 2006;295:1135-1141.